We hope and pray you are doing well spiritually as well as physically. We were able to finalize the cover for the next Bible News Prophecy magazine, work on the following magazine, as well as make significant progress on another animation. We also made some progress on another booklet and have made some improvements (edits/corrections) to a couple of existing booklets. A location has been chosen for this year’s Feast of Tabernacles. If you plan to attend in Canada, please email Herb Haddon to let him know. For information on our 2018 sites, check out: Feast of Tabernacles’ Sites for 2018. Over a Million YouTube Views! We have now passed 1,000,000 views of our YouTube channels as normally reported by YouTube (we have other views, YouTube does not report, based on certain downloads, etc.). We continue to have success on YouTube, despite what seems to be its bias against those who hold to biblically-approved positions. This mainly seems to have affected those who might otherwise find our BibleNewsProphecy channel, though it affects the ContinuingCOG channel as well. The BibleNewsProphecy channel has now had over 618,000 views. The ContinuingCOG channel has had over 386,000 views. The CCOGAfrica channel has had over 5,000 views. Our newest channel, CCOG Animations channel, has over 900 views. We originally choose YouTube ‘television’ because it was convenient and basically free. It also has wide viewership all over the world. YouTube says that “Subscribers watch more,” meaning that they typically watch more of what is on the channels they subscribe to than non-subscribers. Anyway, we have never promoted getting ‘subscribers’ to the YouTube channels, but the numbers have been increasing. The significant increase in subscribers for the ContinuingCOG channel since November 9, 2017 is encouraging. This form of media is helping us fulfill Matthew 28:19-20, as well as Matthew 24:14. We are also working to fulfill Matthew 28:19-20 in more languages as well. 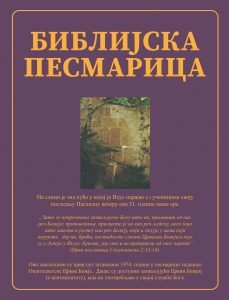 As mentioned a couple of weeks ago, we now have our Bible Hymnal available in the Serbian language. We also ordered copies to be shipped to our Elder Aleksandar Veljic in Serbia. Well, after they arrived in Serbia, they were stopped from getting delivered for bureaucratic reasons, so we have been working on trying to resolve this. Then there were technical problems. But we are still working on this. While this is not ‘tribulation’ it has been a frustrating delay that we did not expect to encounter. I thank God for the great and wonderful work He has done in Africa through the hands of Dr Bob and pastors of Continuing Church of God, Deacons, our representatives in all African countries and our brother Bill Weekend who done wonders in support of the laptops that has made the work easy for translations of books and magazines into different languages in Africa. I also thank Alexander Veljic who took his time to come and preach the gospel in Kenya that added more Faith amongst the brethren in Kenya. God has promote the gospel in African countries by using above mentioned departments to move the gospel in most of the African countries like Kenya, Tanzania, Uganda, Ghana, Ethiopia, Malawi, Mozambique, Zambia and Drc Congo. We have received many calls from Togo and Nigeria. I want to thank Dr Bob and Continuing Church of God in a special way for the hard work in producing magazines, books, weekly updates, websites and financial support which have promoted the work in Africa countries. So many are visiting the Continuing Church of God website. And through website many have learnt the truth about the gospel. The church is producing magazines in Chechewa. This is a national language in Malawi, Mozambique, and Zambia. English which is a national language in Kenya, Tanzania, Malawi, Uganda, Zambia and Ghana. Swahili which is a national language in Kenya and Tanzania. Luo and Ekigusii which are tribal languages in Kenya and Tanzania. We have started translation in Kalenjins language. That tribe is in Kenya. God has done wonders with the hands of the above mentioned departments to move the gospel in African countries. Now we have 27 congregations Kenya, 10 congregations in Malawi and Mozambique. 3 congregations in Tanzania. 1 congregation in Zambia, 1 congregation in Ethiopia, in Ghana, Two families in Uganda and some families in Congo. So many people have been called in God’s family from church of God sects. And some from Pentecostal churches, Catholics and some are heathen whom haven’t been in any denomination. Since the Contnuing church of God laid the foundation in Africa, I have baptized 360 members. Dr Bob baptized one member in Nairobi during the first conference in Nairobi. Bathlomew Otieno has already baptized 54 members. Continuing Church of God now has 3021 members in Africa excluding our members from Ghana where we don’t have exact figure because of some problems in Ghana. Since most of the congregations in Africa are having many members that cannot fit in a members house and since most of African countries are third world countries that cannot manage hire hall where they can meet on Sabbath services, the Continuing Church of God has made steps in building halls in Africa to help brethren on Sabbath services. We have built 17 halls in Kenya to help brethren on Sabbath services. 1 in Ethiopia, feast site in Tanzania, 1 hall in Malawi and made repairs in Mozambique. We have added also some rooms at the feast site in Ndhiwa. I want thank our brother Bill Wedekend who has done wonders in donations of the laptops that has made steps in Africa to help the work of translations of books and magazines into different languages in African countries. And also to help in education system and to eradicate computers illiterate among the brethren. I thank our brethren Steve, Herb and Gilbert who have also given support in different ways. I have been praying for our brother Gilbert for his quick healing. It has been a greater problem in African countries for last years up into this year in both the physical and agricultural sector. Army worms and drought caused bigger problems in African countries for last years up into this year that has resulted in to greater famine. Dr Bob and Continuing Church of God sent much support in Africa countries to help in famine. I thank him for the great support you gave our brethren in Malawi and Mozambique. Also many times we have been given our brethren in Rift valley and Nyakach in Kenya support. This year there is disasters in Rift valley that needs support. Next week I will have a trip in Rift valley where I am going to visit many congregations in Rift valley. The successful work in Africa countries has been made by the magazines, financial support and websites to fulfill Mathew 28:19, Mark 16:15 (Mark 16:16-Whoever believes and is baptized will be saved, but whoever does not believe will be condemned). Mark 16:20-Then the disciples went out and preached everywhere, and the Lord worked with them and confirmed his word by the signs that accompanied it. God is still confirming the gospel by miracles and healing up to these days. Our brother Charles Osutwa who has been sick for many years and has gone to all the hospitals and has tried many herbal to cure his leg which have been a greater problem in his life for last six years decided after failing in all these to call me and deacon Barthlomew Otieno for a special prayer for him to be healed by God. We went with Barthlomew and pray for him that God give him quick healing. Surprisingly after a short period I received a phone call from Charles Osutwa from Mbani that he was healed by God. He called me when he was happy and laughing loudly that he was healed by God. Last Sabbath he called many brethren including myself that we should go to Mbani because he wanted to thank God for quick healing and miracles that he didn’t expect. Because he had already lost hope after going to bigger hospitals and tried many herbals and there was no change. He new the only option is that he is going to die soon. So Charles was very happy to get that he was healed by God. He is a teacher by profession and he couldn’t attend school duties because of serious pain. Not only that, when Alexander Velkic was in Kenya, there was no rain in Kenya and cattle and all animals were dying because there was no rain. When we arrived in Narok town, Alexander Velgic prayed for the rain and after 40 minutes the rain started. It was a wonderful miracles that forced us to kneel down and thanked the Almighty God. Apart from that when I was in Kisii, Eberege, a boy who had disappeared from his parents and he couldn’t be found for almost 8 months ago. The parents approached me and ask me to pray for him so that God can give him way back to his parents. We prayed and told them to be patient. After 2 days the boy was back home. So GOD is still confirming the gospel by miracles and healing. GOD has ordained four ministers in Africa. These are Samuel from Ghana, Sawek from Rift valley, Kenya, Kirui William from Rift valley Kenya. Ezekiel Oanda Kisii Kenya . One Evangelist Evans Ochieng from Kenya. Four Deacons namely – Koang Deng from Ethiopia, Nimrod Ondigo from Kenya, Kennedy Odhiambo from Oyugis Kenya and Granton Otieno from Migori Kenya. Two deaconess namely -Rosemarry Akinyi Ochieng from Kenya and Irine from Nyakach in Kenya. I am planning to visit Rift valley next week and to visit many congregations in Rift valley. Last Sabbath I sent Granton Otieno from Migori to take money for iron sheets to our new congregation of Gribe. We want to help them to build a hall where they can meet on Sabbath services. We also have plan to buy egg hatchery for Eberege Kisii congregation to help them in their project and management. We asked you all to pray for more laborers throughout the years (the first time was in one of our first weekly Letters to the Brethren–see Letter: January 25, 2013). And we have more laborers and have had more growth. Actually, the Continuing Church of God has been the fastest growing COG group of all in the 21st century. Thus, the Bible is quite clear that the open door is the door to proclaim the Gospel–and that Gentiles were an important group to be reached. God is still bringing in more Gentiles. We continue to see more frustration in Europe about the USA. The G7 summit was just one more step (see G7: Six nations worried about Trump’s USA: a setup for WWIII? and DW: Donald Trump, withdrawer-in-chief, strikes again, turns G7 into G6). Europe is getting more determined to separate from the USA. As far as separations go, the USA is becoming more and more divided as media comments about the North Korean summit have shown (see In the dis-United States, media differ on North Korea summit). That, also, does not bode well for the USA (cf.Matthew 12:25). Sermonette, which for most who receive this letter via email will be a recorded one. The one suggested for this week is: Will Islam be Pushed Out of Europe? Other sermonettes are available at the Bible News Prophecy channel. Sermon, which for most who receive this letter via email will be a recorded one. The one suggested for this week is: Mormon vs. Church of God Teachings. Other sermons are also available at the ContinuingCOG channel. Consider also that in the end time, Jesus said that the bulk of Christians will be lukewarm and need to repent (cf. Revelation 3:14-19). Brethren, make sure that you regularly turn to God with all your heart.